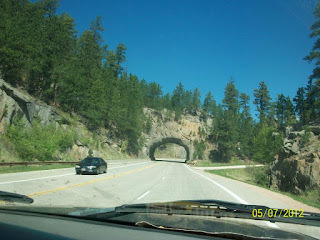 Our list was very long, longer than most Christmas lists from very privileged kids; we had caves of crystals, all of the scenic roads, Sturgis, gold panning, and much, much more. 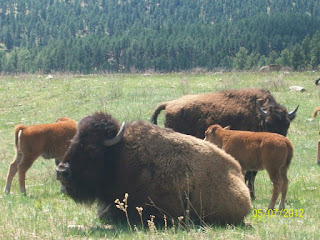 First off, since it was free, we decided to journey through Custer State Park; one of the perks of vacationing during the off-season, free activities that would normally charge an arm and leg. 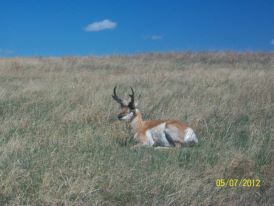 They boasted seeing buffaloes, pronghorns, prairie dogs, mountain goats and possibly a mountain lion if you were lucky. We got lost on the way to the park, it just couldn’t all be going our way for too long. For some reason I just couldn’t read the map correctly and Hwy 16 and Hwy 16A really confused my brain. We did one huge very scenic loop all around the area we were trying to get to, burnt through a lot of fuel; but luckily we were in the 4 cylinder Ranger so it wasn’t too bad. To weigh the views we saw with the fuel we wasted, well that made the waste not seem so bad. We drove through one of the tunnels carved into the Black Hills mountain, there were several along the scenic routes. After going the wrong way on the right road, a few times I might add, we were both very exasperated and irritated. We pulled over and asked for directions, something neither of us wanted to do as we prided ourselves on our abilities to land in a city with only a map and a phone book (for the addresses and road names) and NOT get lost; but here we were, confused and turned around within a few miles of where we needed to be, asking for directions. Come to find out we had missed our exit on this highway carved into the mountains; we were on the right path again. It didn’t take long to arrive at Custer State Park, was a beautiful ride winding through the Black Hills of South Dakota. We were thru the gates to the park and enjoying the lay of the land when we spotted a path into the woods, along a dry creek bed. We quickly got out, grabbed our packs, a hiking stick and started out down the trail. Knowing we were in mountain lion country, we knew to keep the lil one in between us and to get back before dusk; when they were known to roam, hunt and be active. About ¼ mile down the path, the hubby graciously reminded me what time of the month it was and I quickly thought about being mistaken for an animal in heat and ravaged to death by hooves or teeth; it was spring and breeding season for some after all. Only but a few seconds later did we decide that we didn’t have enough bullets and that maybe it would be better to venture out of the truck in a few more days. Back in the truck and back on the more traveled path of roadways, we started seeing buffaloes right off. The lil one really enjoyed counting how many we could see and how many calves there were. We knew to give them their space, we were on their turf, wandering thru their homes after all. There were numerous pictures taken of the herd as we had to wait for several to cross the road; it is never a good idea to try to rush an animal that is all muscle and can turn your small truck over if need be. Soon we were at a crossroads, we took another wrong turn here, but in the process saw some new animals that we had never seen before; later on we found out these were pronghorns. These I would take the chance to get out of the truck, hanging out the window at times to get pictures; they blended so well with the prairie grass, they were almost invisible. A quick turn around and we were venturing farther into Custer State Park, exciting to see some of the many other residents who called it home. We were looking on every mountaintop for the mountain goats, around every corner for more buffalo and especially those cute little prairie dogs. We happened across the Ranger’s station first and had to run inside for a map of the park and to see which was the best route to go to see the critters we were looking for. We met some Yankee folks outside and were talking to them about the prairie dogs. They mentioned that they had seen some weird looking chipmunks down this one particular road; they said they must grow differently over here in the west than in the east. We got a good laugh when we realized they were probably thinking the prairie dogs were the weird chipmunks that grow different in this neck of the woods. Out of curiosity we went down the same road they had, and sure enough there was a colony of prairie dogs out playing for us to enjoy. We enjoyed the rest of Custer State Park and all the residents out for visits, on my list of to-see animals is still the ever elusive mountain lion; to this day I have to see one that isn’t stuffed and mounted, although thinking about it; if I ever do see one it may just be the very last animal I ever personally see alive. 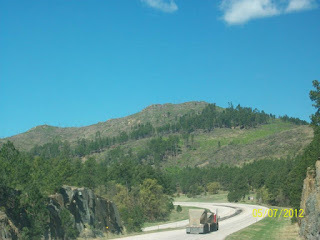 Soon it was on to the rest of our list of places to visit, we still had Crazy Horse and Mt. Rushmore to see.